Xuan Huong Lake Dalat is one of the most famous tourist destination. That why almost visitors do not want to ignore when to travel Dalat. However, not everyone has the opportunity to feel the beauty of Xuan Huong lake in the evening. In this article, Origin Vietnam Travel will bring visitors a special image of Xuan Huong Lake when the night falls. Let's explore right below. Xuan Huong Lake is a beautiful lake located in the center of Da Lat city. Xuan Huong has a circumference of about 5 km, 25 hecta wide, with a crescent-shaped crescent stretching over 2km passing through many Vietnam vacation spots in Da Lat. Such as City Flower Garden, Yersin Park, Cu Hill. Xuan Huong Lake was formerly a valley with streams flowing through Cam Ly. In 1919 Cunhac's initiative was to prevent the stream from becoming a small lake. Xuan Huong Lake has experienced many years of history, this is the "companion" with so many generations of people in Dalat, has witnessed every step of change in Da Lat. 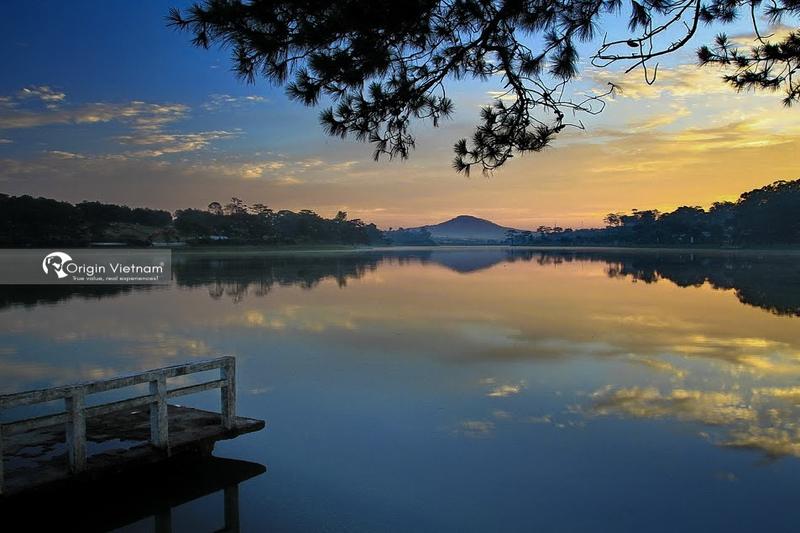 When participating in Dalat tours, many tourists have named Xuan Huong lake out first in the list of stops. This is one of the destinations not to be missed when traveling to Dalat by many people. In the day, Xuan Huong Lake always mellow, blurred in the mist spread covered a sky. The lake quiet, calm air, spacious space, immense. Xuan Huong Lake in the early morning beautiful and peace is like! The beauty of Xuan Huong Lake in Da Lat at night also attracts many visitors, not only for those who first arrived in Dalat. But also tourists who have many times to travel to this city. In the cold air of Dalat, visitors can run a few rounds of motorbikes around the lake to watch the scenery or stop at a certain point to make a picture. To feel Xuan Huong night clearer, travelers should walk slowly to enjoy the most beautiful, romantic, most romantic. When the night began to fall, Xuan Huong Lake like wearing a new shirt. It's become more sparkling, more fanciful. Because of this charming scene, Xuan Huong Lake has attracted many people walking street, enjoying the lake scene at night. When you travel to Dalat remember do not miss the opportunity to see Xuan Huong Lake at night. An overnight experience at Xuan Huong Lake will surely bring you many interesting and memorable memories. 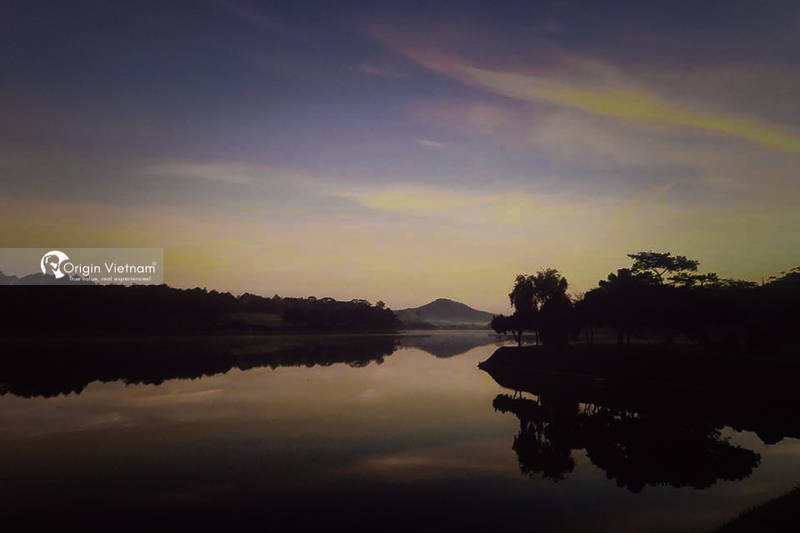 Xuan Huong Lake is considered one of the most beautiful spots in Dalat. 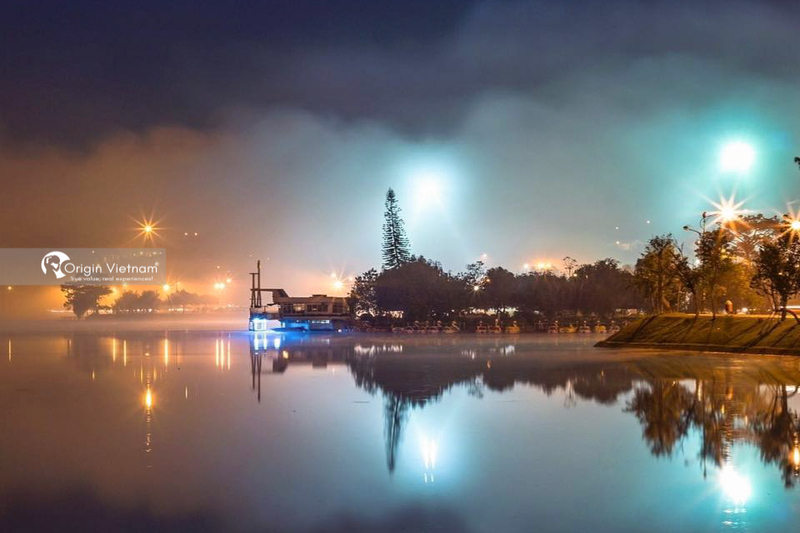 Come to Xuan Huong Lake at night, visitors will be watching the romantic beauty of Dalat city is watching the passersby, hear the sound of cars, see the bustling atmosphere of a vibrant the city of travel at night. Guests can sit on the stone rowing chairs that are lined up around the lake or can also go to the cafés near the lake to sip a very romantic cup of coffee. Indeed, Xuan Huong Lake at night brings a lot of beauty that makes visitors feel. Enjoying food is always one of the primary goals of travelers when traveling to a new land. And so to Da Lat. Many tourists love to discover delicious food in Da Lat at night. Especially in the market or around Xuan Huong Lake area. After a stroll around Xuan Huong Lake, you can find some of the dishes sold around the lake to warm your belly and forget the cold of the night is coming. There are a lot of delicious snacks not to forget when coming here. Such as baked rolls, roasted barbecues, grilled corn, baked sweet potatoes, hot soy milk ... Origin Vietnam Travel believes that if visitors have a chance to experience furniture Overnight in Xuan Huong Lake is nothing like it. After having impressive experiences with Xuan Huong Lake, visitors can visit more beautiful destinations in Dalat such as Love Valley, Cau Dat, Lang Biang mountain. These are pictures of Xuan Huong Lake Da Lat at night of Origin Vietnam Travel for visitors. Hopefully with this sharing will help visitors more inspiration and love for the city of fog Da Lat.